The Paintball Jungle is part of Adrenalin Jungle so offers the very best in paintball experiences with the added benefit of having loads of other activity’s at the same great location, if paintball is all you want then great read on however if you want to mix it up a bit you can easily add quad bikes, archery, knife and axe throwing etc to your booking so click Hear for more info. Set in 150 Acres of Sherwood Forest close to Nottingham, Mansfield, Newark. Voted a top 10 paintball site in the UK by 1 of the industry’s largest suppliers. Great equipment as standard so no hidden costs for upgrades. All players use our kit, we won’t let you become target practice for Pro’s. Free Battle Pack Use, Free Pot use, you need it we give it you FREE. Great Game Zones / Maps for amazing game play. Free refreshments for all guests and spectators. Free Valuable lockers because believe it or not some Venues charge! Minimum age 12 yrs so adults don’t feel like they’re paintballing in a crèche! Price Options meaning you could pay less than £4.60 per 100 paintballs. 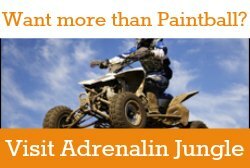 Additional paintballs available from £35 for 500 or £8 for 100. 3 booking options Reserve, Deposit, Pay in Full so you are in full control. Ability to mix packages in your group so your friends can pick what suits them. Payment options Credit Card / Debit Card, PayPal or BACS. Got a group of 16 or more ask us about a PRIVATE GAME. FAQ page for all your other questions so you know what you are getting. Ideally located if you want more than just paintball , we have Quads, 4×4, Segway and more at the same location in Sherwood Forest. 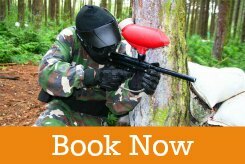 The Nottingham Paintball Jungle was established in 1994 so with over 22 years experience in paintball we are sure our venue set in 150 acres of Sherwood Forest in Nottinghamshire will be able to offer you and your group an amazing paintball experience. Paintball Jungle continues to be the largest site for Paintballing in Nottingham and Nottinghamshire which makes it the perfect venue for groups from Nottingham, Mansfield, Newark and all surrounding areas in the Midlands and if you are coming from further afield our facility’s and paintball zones will make the journey worth it. The Paintball Jungle strives to ensure a player’s day meets all their expectations so we work tirelessly behind the scenes so that when you visit Paintball Jungle Nottingham we can we deliver: impeccable safety, reliable equipment, good staff, safe playing zones and great paintball game scenarios as standard. The Paintball Jungle zones offer our customers a wide variety of paintballing maps / formats so our 7 exciting paintballing zones: Close Quarter Battle Field, The Castle, The Wild West, the Bridge Field, Bunker Hill, Tank Mania and Village Assault ensure your time Paintballing in Nottingham will be varied. Situated in the heart of Sherwood Forest in Nottinghamshire, the Paintball Jungle is able to accommodate groups from 14 (the minimum we recommend for a paintball event) up to 250 paintballers at any one time, but don’t worry if we have got 250 guest booked in we won’t play 125 on each team! as we try to keep squads down to 40 players formed into 2 teams. So if you have a large group we will be able to offer you a private event but if you are only a group or 2 or 3 that’s also OK as we can tell you what days we have a Paintball Game running that you can join in with so we can normally offer al party sizes something that will work for them. We cater for all levels of players, so if you are a 1st time players or a regular weekend warrior we are able to provide you with the right kit, equipment and supervision to ensure your experience is 2nd to none. Players aged 12 years plus can be accommodated on our Cadet event specifically designed for 12 – 16 year olds but if they form part of a family group they can also take part with the adults on our open sessions so they do not miss out. As a customer of Paintball Jungle, we want you to come along, be safe, enjoy splatting your mates, do your best to win the paintball game but even if that’s not the case have fun and leave smiling, whilst planning your next visit to our premier paintball venue so the information on this website is designed to give you all the info you need but if you have any questions not answered hear either give us a call on 01623 883980 or drop us an email from he contact us page. So what are you waiting for? Round up the troops, pick a date, start working on your tactics and get yourself down to the Paintball Jungle! 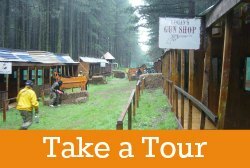 Our unique location in Sherwood Forest makes us the perfect choice if you are looking for Paintballing near Nottingham, Mansfield, Newark.